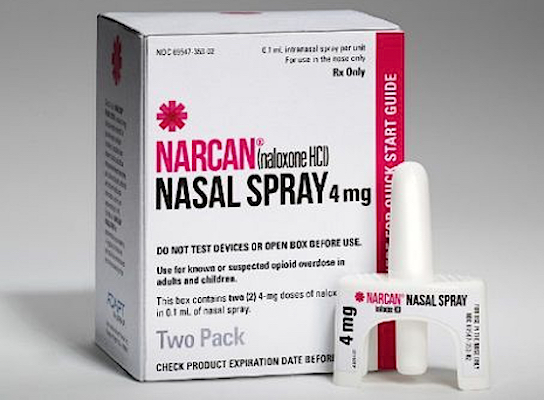 DEERFIELD, Ill. — Walgreens is now carrying Adapt Pharma’s Narcan, a nasal spray form of opioid overdose antidote naloxone, in all of its more than 8,000 pharmacies nationwide. Walgreens said Tuesday it’s adopting Centers for Disease Control and Prevention (CDC) recommendations by educating patients about Narcan Nasal Spray when they are dispensed a controlled substance greater than 50 morphine milligram equivalents (MME) and may be at risk of an accidental overdose. Naloxone, used to reverse the effects of an overdose of opioid drugs, including some prescription painkillers and heroin, also can be administered by injection. AmerisourceBergen Corp. has distributed Narcan Nasal Spray demo devices at no cost to Walgreens pharmacists to use in instructing patients on how to administer the medication. Additional instructions include calling 911, since anyone who is administered Narcan should seek immediate medical attention, Walgreens noted. “We recognize the important role we play in addressing the opioid epidemic, and our collaboration with Walgreens is another key milestone to supply our customers with access to lifesaving initiatives and emergency medications that can help keep individuals safe across the country,” stated Robert Mauch, executive vice president and group president of pharmaceutical distribution and strategic global sourcing at AmerisourceBergen. In February 2016, Walgreens unveiled plans to provide naloxone without a prescription in states where regulations permit. The drug chain said it now offers no-prescription naloxone in 45 states and aims to work with the remaining states to make naloxone easier to obtain.